According to reports from Daily Mirror, Tottenham have slapped a £75m price tag on Toby Alderweireld. The 29-year-old has been linked to us in recent months as the search for a new defender continues. Jose Mourinho wants a new player to add to his defence; with Victor Lindelof showing inconsistency and Eric Bailly having had injury issues, he is not convinced about the quality of Chris Smalling and Phil Jones. 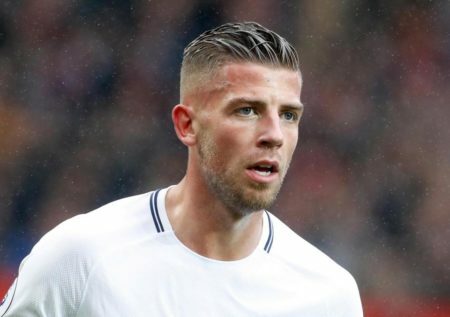 Alderweireld is reportedly on a three-man shortlist and it seems that Tottenham have made their intentions clear. Alderweireld is open to the possibility of leaving North London this summer, having reportedly fallen out with Mauricio Pochettino last term. He was also injured for parts of the campaign but after his return, he was left on the bench as the manager stuck with the centre-back partnership of Davinson Sanchez and Jan Vertonghen. He has just a year left on his deal at White Hart Lane, but negotiating maestro Daniel Levy has still placed a mammoth price tag. Tottenham do have a 12-month extension clause in his contract but that would also mean a £25m release clause is activated next summer. The Sun, as cited by Daily Mirror, also report that Spurs chief Levy met with his United counterpart, Ed Woodward last week to sort out a deal. For a player that has just a year left on his deal, £75m seems a bit steep though it is believed that the player wants the move. After seeing the likes of Manchester City and Liverpool strengthen in the transfer window so far, Jose Mourinho wants more marquee signings. Alderweireld was majestic at the World Cup, helping his team to the 3rd place at the tournament. He is a classy centreback known for his astute reading of the game, aerial strength and tough tackling. He will add quality to the United backline and offer more solidity to a defence that conceded just 28 league goals last term. Manchester United can have Alderweireld if Tottenham can have Martial, otherwise no deal.